Modi says ruling party does not like the fact that a tea seller is challenging its empire. Ahmedabad: Launching a scathing attack at Congress, BJP'sPM candidate Narendra Modi on Thursday said the Congress keeps looking for chances to kill him or beat him. "The Congress does not like the fact that a tea seller is challenging and questioning such a big political empire. They keep looking for chances to kill me and beat me," said Modi, while addressing a huge youth rally in Ahmedabad. The Gujarat CM said that Congress leaders may throw muck and let loose CBI at him but that would not be able to stop him from serving the country. In an emotional pitch to reach out to the youth he also said he had not "left his house" for any post or for fame. Addressing a huge youth rally in the city, Modi said, "If I speak the truth, all the ministers of the UPA government get unhappy, they feel bad and get dejected." 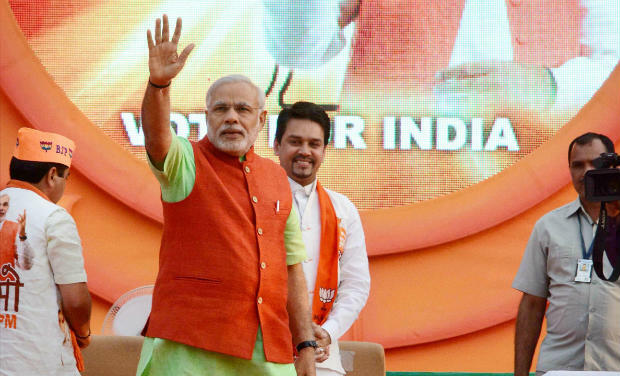 Modi said the Congress is flabbergasted and remain in search of opportunities to hit Modi. "My Congress strongmen, what more can you do, you can throw muck, you can let CBI try to nail me, you can take me to courts...," he said. "But I am here to serve this nation birth after birth, If I don't get chance in this birth, I will come again in the next birth to serve the people of the country." "I have not left my house for any post or fame. To acquire, to be something is not my goal...," he said. Taking on the UPA government's policy for the youth of the country, Modi said it was the responsibility of those in power to think about them, give skill development training, jobs, and turn the demographic dividend into advantage, or else the large population of the youth will turn out to be a disadvantage. "In the last year's budget, the central government had claimed it will give skill training to 10 lakh youths and had made a provision of Rs 1,000 crore," he said, and claimed, "In reality they have given training to just 18,352 youths in the last year." "This is five percent work done. At this rate the Congress government will be able to complete the target in the next 20 years," he said.